Can you imagine impassioned rock songs in modern Chinese Popular culture? Tyson Gibb just did a great blog post with his 10 top rock songs from China along with translations and language suggestions. Drop by his post to hear and read about these powerful songs that comment, question, protest and generally turn rock music into a vehicle for mainstream Chinese voices. One of the great tragedies of world poverty are people who risk everything to start a new life but end up in the hands of human traffickers. Recently, Rohingya and Bangladeshi migrants had been stranded on traffickers’ boats for weeks off the coasts of Thailand, Malaysia and Indonesia with no country allowing them a safe harbor. 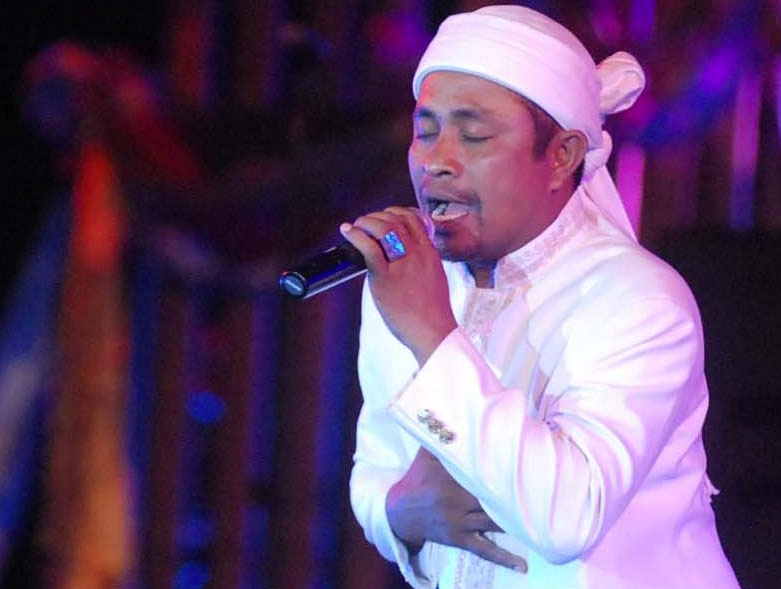 The recent benefit concert was said to feature his music – accompanied by with a massive percussion ensemble and an outpouring of charity from the local people for the stranded migrants, many of which share the Muslim faith. We’ve been unable to locate photos or footage from that specific concert which was held in a country still recovering from a tsumanai, however, PRI’s THE WORLD, aired this spot as an update on the continuing story of these people and how they’ve found a place that wants to welcome them; with music and open arms. Although we don’t generally cover news about crowd-sourced projects, this one is so different and so special, we wanted to share it here and encourage you to participate. 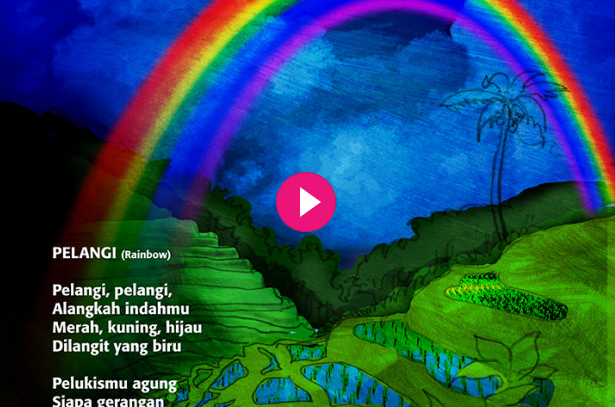 The project is an Indonesian children’s music CD and book set, a compilation of best-known songs along with a book filled with beautiful notes and illustrations. The songs are easy to sing and have gorgeous, memorable melodies. Feel free to go to this direct link for project and funding details or watch the video below. In addition, we’ll have the story behind this project in our next post, so please stay tuned and consider donating $10.00 for all the songs on the cd, $20.00 for the songs plus the physical book or even more to help this wonderful folklore project become a reality. If you’re near the Los Angeles area, you’ll have a rare chance to see some of the world’s most fascinating Pacific Island drums on display as part of an exhibit on the art and culture of Papua, New Guinea. 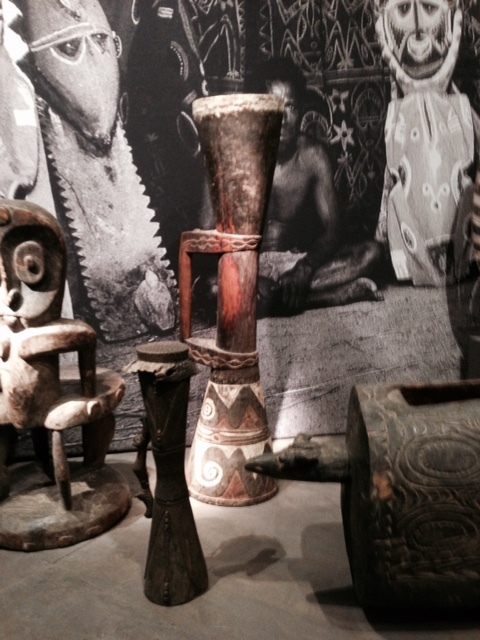 Currently at the Bowers Museum in Santa Ana, California (USA) is an exhibit entitled: Spirits and Headhunters, Art of the Pacific Islands that shares impressive cultural artifacts including many that reflect the music and dance of this region. So what’s so different about drums from New Guinea? The first thing you might notice is the impressive size of the slit drums featured in this exhibit. 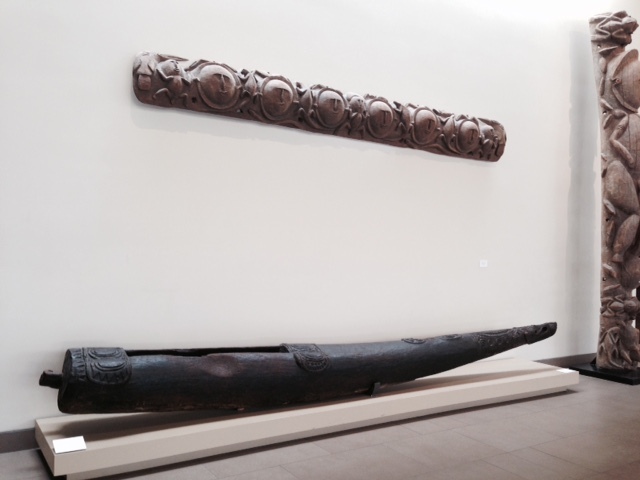 In fact, the two large slit drums on display (pictured right and below, left) are each the size and shape of a large canoe! Hollowed out partially inside, both slit drums are struck with beaters, put on a type of cart and moved from place to place while being played. 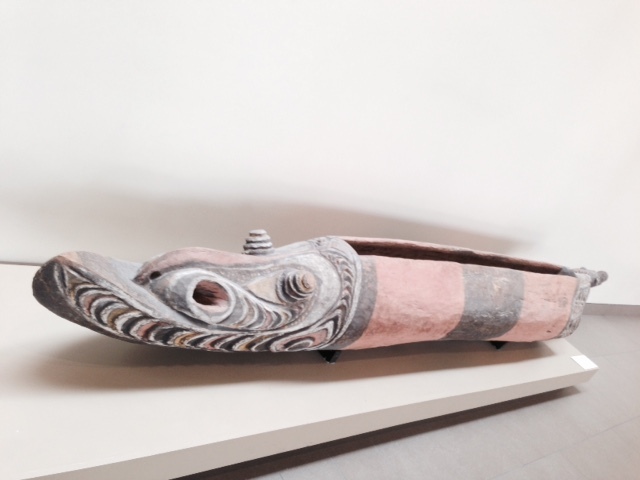 The smaller drum (below) was created and decorated with the motif of a crocodile, who is considered to be an ancestor spirit in the Sepik region. In this area, the drum is played near a river and it is sometimes considered that drum itself is a spirit and that it’s tones reflect the voice of the ancestors or the divine. 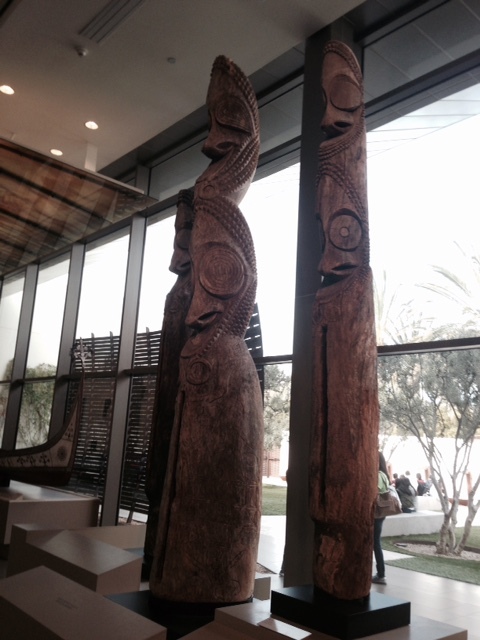 In addition to the “horizontal” slit drums, there are also several large standing wood sculptures that resemble 10 – 15 foot totem poles (pictured above left). Remarkably, these are also slit drums and are played with beaters as well, often used as methods of communication between tribes or groups of people. Of course, there are also the more traditional looking drums like those seen here as well as an example of a finger-drum which which would have had a lizard skin “head” from the Massim culture of the Milne Bay province of Papua, New Guinea. All in all, this relatively small exhibit is an amazingly deep journey into the musical, spiritual and artistic life of this important world culture. One major cultural highlight of the closing ceremony of the 2014 Sochi Winter Olympics was a large group of children singing Russia’s moving National anthem. Formally known as “The State Anthem of the Russian Federation”, this powerful patriotic song was adapted from the National Anthem of the Soviet Union, composed by Alexander Alexandrov with original lyrics by Sergey Mikhalkov and Gabriel El-Registan. 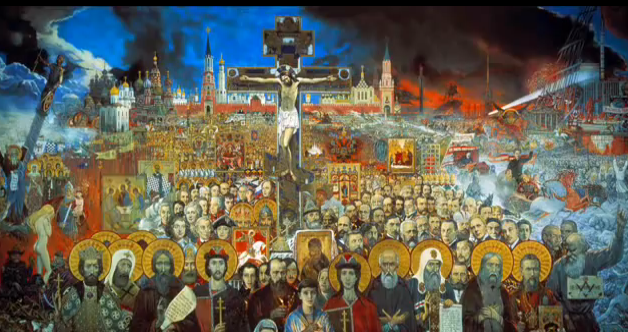 The history of national anthems in Russia is a bit complex. Before 1944, Russia and all other member states of the Soviet Union considered the song “The Internationale” as the national anthem of the USSR. At that point, the USSR saw a need for a national song that spoke more about the Soviet experience and the National Anthem of the Soviet Union was adopted. After the collapse of the Soviet Union, Russia adopted a new instrumental piece of music as their national anthem. It was composed by Mikhail Glinka and titled “Patrioticheskaya Pesnya”. When that melody failed to inspire and no perfect set of lyrics could be found, Vladimir Putin reinstated the old Soviet anthem and sponsored a contest for updated lyrics. This new anthem, in its current form, became official in 2000 and you can read the lyrics below in Russian, transliterated Russian and an English translation. Rossiya – lyubimaya nasha strana. Tvoio dostoyanye na vse vremena! Slav’sya, strana! My gordimsya toboi! Raskinulis’ nashi lesa i polya. Shirokii prostor dlya mechty i dlya zhizni. Nam silu daiot nasha vernost’ Otchizne. Tak bylo, tak yest’ i tak budet vsegda! Russia – our beloved country. These are your heritage for all time! Ancestor-given wisdom of the people! Be glorious, our country! We are proud of you! Spread are our forests and fields. This native land protected by God! Our loyalty to the Motherland gives us strength. Thus it was, thus it is and thus it always will be! There’s a special kind of hula, called hula ‘ili’ili, that’s done with the dancer tapping smooth river stones together as part of the rhythm and the dance. Hula is a rich and beautiful tradition from Hawaii that actually originated with the Polynesian people who first settled in this region. Hula can be done sitting or standing and can be accompanied by chants or song. And it incorporates many unique and wonderfully simple instruments – such as pu’ili (bamboo sticks cut to sound as rattles) or ‘ili’ili, smooth stones held in the hand in a manner similar to castanets. You can read more about pu’ili in the posts below. Here’s more about the river rocks. ‘Ili’ili are two smooth stones, approximately the same size, that are held in a dancer’s hand. The hand movements tap the stones together for the percussion sound and that becomes part of the overall arm movements incorporated into the dance. If that sounds too complicted, here’s a short video by Kuma (Kuma is a respectful title meaning teacher or source of knowledge) Rachel that shows how to master the basics of playing ‘ili’ili. What kind of stones are used as ‘iliili? Most seem to be the dense smooth stones that come from volcanic rock and have been worn perfectly smooth by water. They are often dark in color and are the same type of stones (basalt) used in hot stone massage therapy. 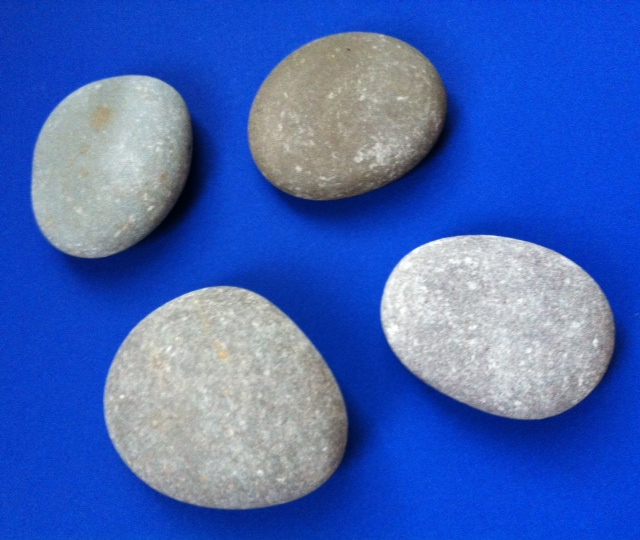 A set of 4 rocks is required to play ‘ili’ile. Can you try this at home if you don’t live in the Hawaiian islands? Absolutely. Choose four smooth rocks and practice the techniques above to create your own version of this perfectly natural percussion instrument! Learn a Chinese New Year Song! In 2014, January 31st marks the first day of the Chinese New Year and we welcome in the year of the horse. The Chinese New Year is a feast for all the senses! It brings delicious foods, parades, firecrackers, red envelopes and family gatherings. And, of course, the popular song: Gong Xi Gong Xi. Lyrics to this song are simple and easy to learn. Here is a version in pinyin and English as well as two video versions to help you sing or share this song with children at this exciting time of year. What Can An Erhu Do? Although you might not recognize the name “erhu”(二胡; pinyin: èrhú, [êɻxǔ]), you would immediately know it’s distinctive sound. One of a family of stringed, bowed instruments from China, the erhu is sometimes called a Chinese fiddle, a 2 stringed violin, a southern or spike fiddle and it’s origins date back at least a thousand years ago to when it was brought to China by the Xi people of Central Asia. From these humble beginning, the versatile and evocative sound of the erhu has won it a major place in Chinese orchestras, as well as a starring role in modern musical ensembles including, jazz, pop and even rock groups. How Is The Erhu Made? The erhu is an unusual instrument in many ways. It consists of a small sounding box made of a hard wood, such as sandlewood, that was traditionally covered with snake or python skin. Some musicians and orchestras; such as the Hong Kong Chinese Orchestra, have recently sought out more ecologically-friendly versions and developed a series of erhu and related instruments that are made from a polyester membrane instead of snakeskin. 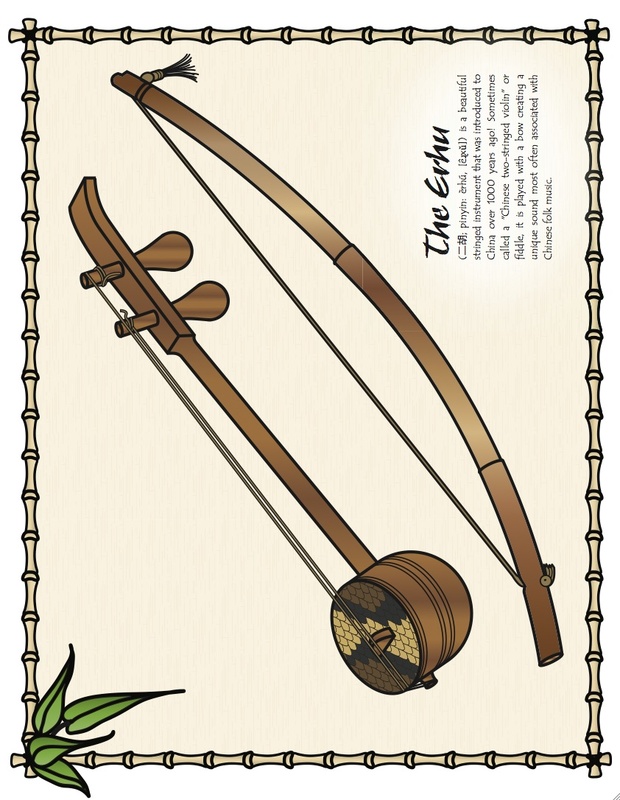 The bow used for an erhu was originally made of a bamboo stick strung with horsehair. Although the sound of the erhu is similar to the Western violin in many ways, there are several striking differences. First, the erhu has two strings and the violin has four. Next, the erhu is played on the lap of the musician while the violin rests between the shoulder and chin of its player. Also, on the erhu the strings are pressed but do not touch the fingerboard and the bow does not leave the strings. On the violin, fingers touch the fretboard to create different notes and the bow will move on and off the strings while it is being played. If you take a look at the video below from Danwei TV, you’ll be able to see many of the unique qualities of this beautiful traditional instrument from China. If you’d like to print out a version of the erhu coloring page seen above, you can visit the links below. One musician comments on playing the instrument and performs a popular folk song called “Running River” on the erhu. Boing, Boing, Boing…It’s a Jaw Harp! Although the jaw harp is a rather simple-looking instrument, it has quite a long and interesting history dating back at least the 4th century BC where it appears as a musical instrument in a Chinese drawing. It can be found throughout Asia and in various cultures around the world and has a host of different names including mouth harp, Ozark harp, juice harp, Jew’s harp, jew’s harp, trump, drymba, doromb, khomus, kubyz and quote a few more that vary according to the culture and type of music where it is being played. 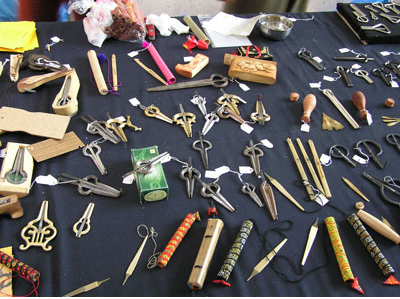 Check out the wide variety of jaw harps seen here from the home page of the Jew’s Harp Guild website (used by permission). Is the jaw harp related to Jewish culture since it is sometimes called a jew’s harp? Most historians think the phrase “jew’s harp” is a mispronounciation of one of its popular names as it is not found within Jewish folk music or Semetic cultures at all. It is; however, frequently used in ritual practice and shamanic music. The droning sound of the instrument can create a trance-like state and is widely used in regions of Asia in this manner. 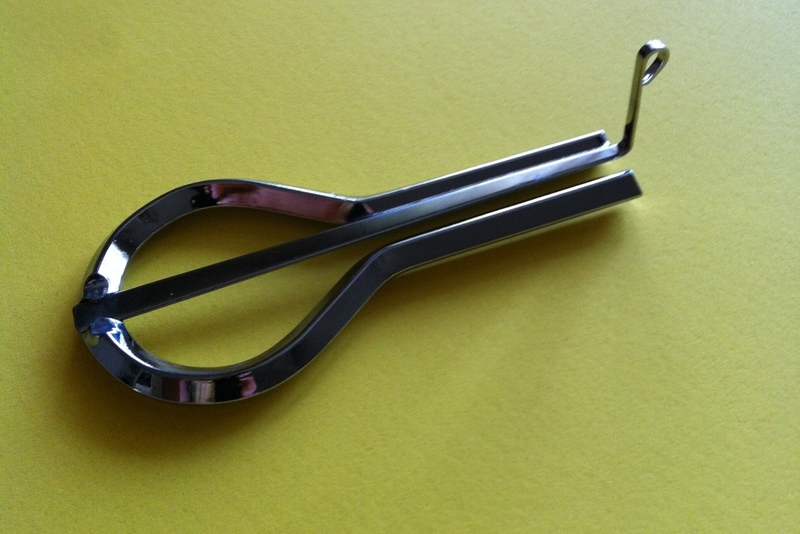 A jaw harp consists of two parts. There’s a frame held inside the mouth and a “tongue” piece that is plucked outside the mouth by the musician’s finger. Although this might sound easy, there are many techniques used in playing the instrument and some require a good deal of practice to master. When putting the harp in your mouth the upper and lower lips should rest on the top and bottom of the frame, the front teeth must be slightly apart. Try plucking the harp by pushing or pulling. While the “tongue piece” is in motion, silently pronounce “A-E-I-O-U”. This shows you how to create different sounds by changing the size of your mouth cavity. Breathing in different ways and moving your tongue slightly also changes the sounds created by the jaw harp. Experimenting with this will allow you to find different ways to create your own music on this unique instrument. What does a jaw harp sound like? Check out these three very different examples of jaw harp music from Mongolia, India and Hungary. Mongolian Shaman Playing Jaw Harp from Lauren Knapp on Vimeo.